Gem Rocks is a work of art when it comes to online slots. Exciting, beautiful, original, and immensely rewarding when the Lady Luck smiles on you. The game offers you a chance of winning 9,000x your bet and guarantees that you’ll enjoy playing no matter what. Yggdrasil Gaming achieved an outstanding success in 2017. The company’s revenues have grown by 95%. The developer also got global recognition by winning the Slot Provider of the Year 2017 Award from EGR and Innovator Supplier of the Year of the International Gaming Awards 2017. Releasing such a magnificent slot at the beginning of 2018 proves that those awards were well-deserved. In fact, judging by how great Gem Rocks turned out, there might be more of them coming to Yggdrasil Gaming this year. It’s definitely not a surprise that Gem Rocks runs on Yggdrasil’s iSENSE 2.0+ platform. It was revamped in 2017 and proved to be a major success. The game also has integrated BOOST™, which is another major innovative achievement from the developer that helped Yggdrasil to become a true iGaming revolutionary of the last year. The power of this platform ensures that the game runs smoothly and beautifully on any device, be it a desktop PC or a smartphone. The joy of playing Gem Rocks won’t diminish no matter the gadget as the design and gameplay have very few minor differences dictated by the demands of the devices. Gem Rocks is a 6-reel online slot that gives you 4,096 ways to win. To sweeten the deal even further, the game has a chance of winning streaks. The multipliers are set up in such a manner than the most lucky players can get up to 9,000x their bet. 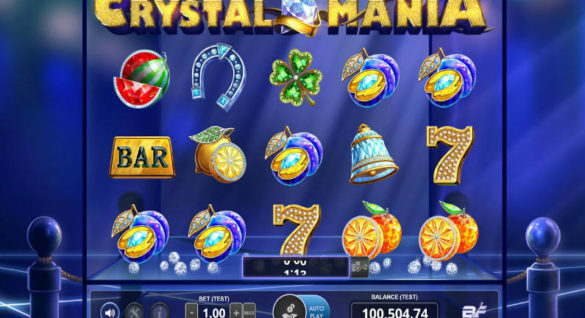 This alone is sure to make Gem Rocks one of the most popular slots of this year. This slot is designed specifically for the fans of high-variance games who enjoy risking for mighty rewards. The RTP (return to player) rate of the game is 96.2% and the maximum coin size is 1. The minimum coin is 0.002, so you can explore the game wagering very little but have a chance of winning big. You can get cascading wins in this game and colossal symbols introduce interesting bonus and multiplier opportunities. The most outstanding feature of the game that also makes it unique, is the Gem Rock feature. To obtain its maximum power you’ll need to get 9 consecutive wins. However, it’s activated at 2, so you’ll get some benefits then. The biggest Gem Rock you can get is 4×4 made of the high-value star gem. This will give you a chance of scoring the biggest win in the game. Do note that winning combos made of star gems pay more by default. That is sure to become your favorite gem, and it’s beautiful to boot. Alas, obtaining the ultimate 4×4 Gem Rock is a rare occurrence. It’s when hunting for it that you get to truly see that this is a high variance slot. However, the game is both enjoyable and rewarding even without catching the elusive beast of the ultimate big win. While big wins are attractive, there are literally hundreds of online slots that offer the same thing. Yet, Gem Rocks is sure to beat the majority of them with its unique stunning design. The moment you launch this game, you understand why Yggdrasil Gaming won all those awards and became a major player on the online gambling software market. The game is beautiful and honed to perfection up to the smallest details. The sound effects fit in so seamlessly, you can play wearing headphones and really feel as if you are located somewhere near a rather gentle rockfall. The sheer depth of the Yggdrasil developers’ talent shines through the fact that they managed to create a beautiful and charming game about, well, rocks. Your first meeting with Rock Giants is sure to be memorable because those guys are adorable. The design of the game overall is superb and gems the giants have for hearts give the slot a sort of fantasy feel. The sound effects and soothing music give Gem Rocks a unique atmosphere that relaxes you and allows to enjoy the immersion into the game. This also highlights the joy of the winning moments as the excitement brightens the overall soothing atmosphere of the game. Gem Rocks is set to become a favorite for many. However, the high level of volatility means that it will never become an online slot loved and played by all. However, the game is done so beautifully, you should give it a try no matter what. It’s currently available in almost all Yggdrasil powered casinos and will soon be available to Spanish gamblers as well. Yggdrasil Gaming has just signed the papers that grant it Spanish license. This deal so early in the year promises many other achievements to come for this rather young developer.